When people talk about history in Taiwan, the first place that comes to mind is "Tainan". The city which is in the south of the country was once the capital of the island and is often referred to as the "Capital City" (府城) despite Taipei currently being the capital of Taiwan. The city is one of the oldest in the country and if you've spent any amount of time in Taipei, a walk through Tainan almost seems as if you're been transported to a completely different country. Tainan's modern history of development stretches back to when the Dutch East India Company established a fort and trading post in the area in 1624. The city then became the capital of the Kingdom of Tungning (東寧王國) established by Koxinga (鄭成功) and his family after the Dutch were expelled which was then followed by a period of control by the Qing Dynasty (清朝), the Japanese Empire and the Republic of China. Through all these turbulent periods of political and foreign rule, the people of Tainan have been able to absorb those foreign cultures, cuisines and architectural styles and build a unique city with an identity of its own with arguably the best cuisine in the whole of Taiwan. While Taipei might currently occupy the position as the political capital of Taiwan, Tainan is certainly the cultural capital and if you want to really experience Taiwan's 'folk culture' at its best, a trip to Tainan is the best recommendation anyone can give you. The amount of historical and cultural sites available for both domestic tourists as well as international travellers is enough to keep you busy for days. In this post I want to talk about one of Tainan's oldest and most celebrated residents - The Tainan Confucius Temple. The temple with its three and a half century old history was the first Confucius Temple constructed in Taiwan (of which there are now many) and is considered to be the first real "school" in Taiwan. The temple today serves as a popular tourist attraction and is an important historical site where ancient tradition is both practiced and preserved so that future generations can continue to experience not only Confucian philosophical values but also the Taiwanese folk traditions which have helped shape Taiwan into the country it is today. To start, I want to make a bit of a clarification in case you are confused about the name of the temple. The Tainan Confucius Temple (台南孔子廟) goes by a few names, I'm going to be consistent with this post and refer to it only as the "Tainan Confucius Temple", but for clarity sake the temple also goes by "Taiwan Confucius Temple" (臺灣孔廟) as well as the "Scholarly Temple" (全台首學) or “Taiwan's first school" depending on how you want to translate the Chinese name. Each of the names reflects a period of Tainan's history - The "Scholarly Temple" refers to the fact that the "first" school in Taiwan was founded on the grounds of the temple while the "Taiwan Confucius Temple" receives its name from a time when the temple was the only Confucian Temple in Taiwan and was the place where people would have to go not only to receive an education but to prepare for the Imperial examination (科舉) if they wished to become a civil servant. Today there are more than twenty Confucius Temples in Taiwan and each one is associated with the city in which it resides, so referring to the temple as the Tainan Confucius Temple today makes sense. 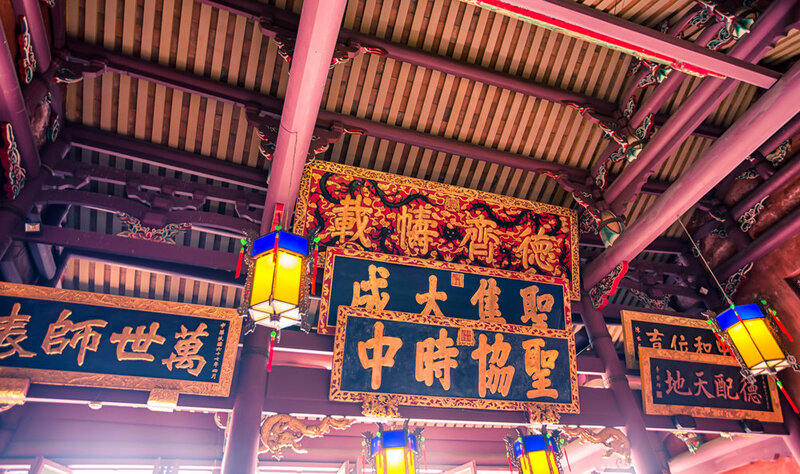 The temple easily makes claims as being the first in a few areas - It is considered to be the first educational institution in Taiwan, the first Confucius Temple as well as the first temple dedicated to the veneration of literature and the arts. With a history dating back to 1665, the temple has gone through several different transformations and has had to be rebuilt several times due to the turbulent nature of Taiwan's political and colonial history. Even though not all of the buildings we see today are over 350 years old, the fact remains that this temple has played an instrumental role in Taiwan's history. To explain the history in clear terms, I'm going to separate it into different sections based on the different colonial and political eras that Taiwan has undergone and talk a little bit about what happened at the temple during each period. The Tainan Confucius Temple was originally constructed in 1665 under the instruction of Zheng Jing, the son of Ming-loyalist and Pirate-King Koxinga's (鄭成功). The Zheng family is an important one in the history of Tainan and even though their Kingdom of Tungning (東寧王國) lasted only two decades (1662-1683) before being overthrown by the Qing Dynasty, they made a lasting impact on the city. The Zheng Family which set up shop in Tainan in a (failed) attempt to amass the forces necessary to overthrow the Qing dynasty (清朝) and restore the Ming dynasty (明朝) sought to promote the principles of the Ming which included Confucian values of education as well as encouraging the people of Taiwan to take up the civil service exam. The temple built in 1665 included a small Dacheng Hall (大成殿) where the veneration of Confucius would take place as well as what we now refer to as the Minglun Hall (明倫堂) which is credited with being Taiwan's first place of public education. During the Qing Dynasty the grounds of the Confucius Temple were renovated and expanded upon several times to include two halls to the east and west of the main shrine as well as the Chongsheng Shrine (崇聖祠), a shrine to the Taoist Earth God (福德正神) and a shrine dedicated to the God of Literature (文昌大地). The Temple was renamed at the time to reflect its importance as Taiwan's first school (全台首學) but was known locally as a Confucius Temple. The Qing didn't really have a lot lot of influence in the south of Taiwan but the expansion of the temple was an important part of its history and even though the temple we see today isn't the same as what we see today, the Qing government laid the foundations for the current design according to the traditional architectural style of Confucius temples in China compared to what was originally put in place by the Cheng family. During the Japanese Colonial Era the temple initially kept up its role as a place of education and became part of the Japanese public school system. Later, the Japanese built a much larger school on the temple's grounds (Today's Zhongyi Elementary School 忠義國小) and then appropriated neighbouring land to construct the Tainan Martial Arts Hall (台南武德殿). During the Second World War however the temple suffered the same fate as a lot of other ancient places of worship in Taiwan (Longshan Temple, Taipei Confucius Temple for example) and became a hiding spot for munitions which ultimately made it a target for allied bombing campaigns causing quite a bit of damage with required the temple to undergo a number of repairs and renovation projects. When the Republic of China (under the control of the Chinese Nationalist Party) became the governing authority over Taiwan the government took quick steps to erase Japanese language and traditions among the population. The government came up with a campaign to 'promote' Chinese culture which ultimately stretched beyond Japanese and promoted Mandarin over all of the other languages spoken in the country. The promotion of traditional Chinese culture became an important aspect of the governments policies and places like Confucius Temples were looked upon as perfect places for the government to achieve their goals. The Tainan Confucius Temple being the temple in Taiwan with the longest history was thus promoted as an important tourist site and place for people to go and pay respects to the all-important Chinese philosopher and educator while newer temples were constructed in his honour in various other cities throughout the country. Additions to the Tainan temple were made as well as both repairs and renovations since then with work being done in 1953 (民國42年), again in 1977 (民國66年), 1979 (民國68年) and then once again in 1989 (民國78年) shortly after the site was granted protected status as a national historic site. While the temple's history has spanned a number of different political eras, a new tradition started when the ROC set up shop on the island. It became a tradition with each of the presidents presenting a plaque to the temple with one of the many sayings of Confucius. Despite the polarizing political situation in Taiwan it is a tradition that has been kept since the time of Chiang Kai-Shek all the way to the current president. Confucius temples tend to be uniform in their simplicity - Unlike the overwhelming beauty of Taiwanese folk temples and Taoist temples - Confucius temples stand alone in their almost "zen-like" nature in that they don't have shiny gold or bronze decorations and murals all over the walls with hundreds of sticks of incense creating a haze throughout the temple. The simplicity exhibited in Confucius temples throughout China, Hong Kong and Taiwan is meant to be a show of respect to Confucius as well as the importance of his philosophical views of education and his influence on Chinese culture and history. One of the common features of all Confucius temples is that there is no imagery or statues of Confucius. This is a rule that goes back almost 500 years to the Ming Dynasty (明朝) when the emperor decreed that all Confucius temples should be uniform and only have "spirit tablets" (神位) rather than images of the sage. Although if you really want to see a statue of the sage there are several temples nearby this one that have shrines dedicated to him. Dacheng Hall is the main shrine area of any Confucius temple - The hall sits in the middle of a granite courtyard with a large elevated platform in front of it as well as on the sides. Inside the hall is a very simple shrine set up with the Confucius Spirit Tablet (神位) on a nice red table with several plaques above it. One of the main differences between this Confucius Temple and the others throughout the country is that while we often refer to it as the "Tainan Confucius Temple" it is also known as the "Taiwan Confucius Temple" due to its historical importance. Because of this, it has become tradition since the Republic of China took up shop in Taiwan for each President to place a plaque of their own in the shrine room with each President making their own addition. This shrine room is a stark contrast to what you'd normally see at a Taoist temple in Taiwan and the plaques are probably the shiniest things that you'll notice when you walk in the room. The simplicity of the shrine room is something that is common with all Confucius Temples where priority is placed not on the man as a "god" but as an extraordinary philosopher and educator. On either side of the Confucius shrine there are additional shrines dedicated to the four sages (四配) Yan Hui (顏子), Zengzi (曾子), Zisi (子思) and Mencius (孟子) who were Confucius scholars and authored books which expanded upon the Confucian philosophy and has had a lasting impact on Chinese culture and the diaspora of Chinese people's throughout the world. The building is the highest building within the main complex and is elevated off the ground. In the front of the hall is a stone carved mural of a dragon with several more dragons on the roof. In the middle of the roof there is a 'seven-levelled' pagoda which is thought to suppress evil. What most tourists don't realize about the temple is that while it is advertised as having an over 350 year history, it has since been reconstructed several times and the Dacheng Hall that we see today was actually reconstructed in 1977 making it only about 40 years old. The Dacheng Gate acts as the entrance to a Confucius Temple. The gate typically forms a perimeter around the courtyard and the Dacheng Hall. In most cases the gate is likely to be the most ornate part of the entire temple with murals to the sides of the main entrance as well as intricate designs on the roof. The Dacheng Gate and the courtyard in front of it at the Tainan Confucius Temple is a popular meeting place for the people of Tainan and is often the site of quite a few events with seniors coming out to practice Tai Chi in the mornings, sing karaoke in the afternoon as well as various other activities. Taking into consideration that the front of the Dacheng Gate is often a busy place, it is often quite difficult to get wide angle photos of the main shrine without a bunch of people crowding up the picture. For a photographer it can be a bit annoying but truthfully I think the fact that the temple is so busy is a great thing. The gate also acts as a place where you need to pay an admission fee to gain access to the main part of the shrine. In most cases I wouldn't pay admission to gain access to a temple, especially a tourist temple, but in the case of the Tainan Confucius Temple I'm happy to pay the 25NT entrance fee as the money goes towards the upkeep preservation of the building. The Gate was constructed in 1715 and was restored between 1987 and 1989. The murals on the outside of the gate are in excellent condition and were wonderfully restored. The roof is constructed with a three ridged Swallow-Tail ridged roof (燕尾脊) design. The Chongsheng Shrine is traditionally situated behind the main Dacheng Hall in all Confucius Temples and is used as a shrine room to venerate several generations of the ancestors of Confucius as well as the various Confucian sages and philosophers throughout history. This shrine room is not unlike a shrine room that you'd find in any large Taiwanese home and is an important place for ancestral worship for the descendants of Confucius. Those descendants have spread out throughout China, Taiwan and Korea so the Confucius Temple's throughout Asia also act as an ancestral shrine giving them a place to worship. The shrine venerates five generations of Confucius's descendants and is a windowless room made of wood with eighteen beautiful red pillars. The shrine was constructed in 1723 but underwent repairs most recently 1985 and 1986. The Education Hall or "Minglun Hall" is probably my favourite part of visiting the Tainan Confucius Temple. As I've mentioned above, Confucius Halls are for the most part uniform in design but this one is able to get away with being a little different thanks to its historical importance. The Education Hall at the Tainan Confucius Temple actually predates the temple itself and is the reason the temple gets its name "Taiwan's First School" (全台首學). The hall was built in 1663, expanded again in 1700 and then renovated and restored between 1987 and 1989. It consists of a main gate with a courtyard and the main building which is usually open and has excellent air circulation. Design-wise, the exterior of the Education Hall follows a lot of the same design techniques as the Confucius Temple especially when it comes to the roof. The interior however is what separates this small hall from the rest of the temple complex. The interior is a calligraphers wonderland and features a beautiful wall of calligraphy taken from "The Great Learning" (大學章句), one of the four books authored by Confucius and is a recreation of the work of Zhao Mengfu (趙孟頫) one of the greatest calligraphers to have ever lived. 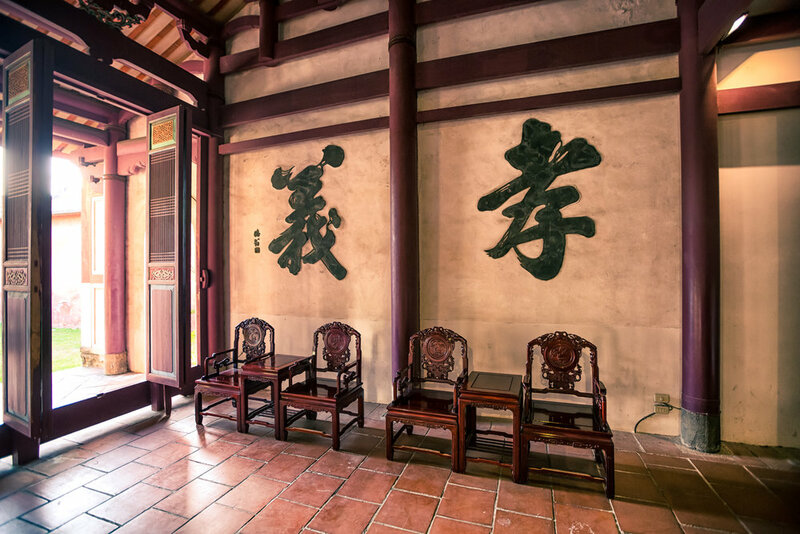 While the main attraction to the hall is the wall of calligraphy that faces the exit, there are also two large characters on each wall facing each other that read "忠孝節義" and refer to loyalty and filial piety which are the cornerstones of the Confucian philosophy. Behind the Minglun Hall is the Wenchang Pavilion, which actually looks more like a pagoda than a pavilion. The pavilion is often open to the public but usually only the weekends. The pavilion has three floors and has a very narrow stairway that allows guests to walk up the old wooden stairs. Each floor has a shrine to a Taoist god with there being a shrine dedicated to the Great Master Kui (魁星) - whom interestingly I heard a young Taiwanese man in front of the shrine refer to as "Kui-Ge" (魁哥) which is a Taiwanese colloquial way of calling him "Brother Kui." The third floor is dedicated to the Wenchang Emperor (文昌大地), the Taoist God of Literature and is an important god for students who want to score well on tests or gain admission to a good school. The best part of the old pavilion is the view you get from the windows on the second and third floor which give you a nice vantage point to check out the roof of the Confucius Temple. The Tainan Confucius Temple is considered to be one of those must-visit tourist spots not only in Tainan, but also in Taiwan. The temple is more than three centuries old and is taken care of extremely well. The modern history of Taiwan through all of its political turmoil and modern development are written all over the storied walls of this beautiful temple complex. A stop here not only offers tourists a chance to learn about Taiwanese history but allows guests to really appreciate a bit of peace and quiet in Taiwan's first place of higher education. If you are visiting Taiwan, I can't tell you how important it is that you make it a priority to get out of Taipei and spend some time visiting Tainan. The history of this country is put on display in every little nook and cranny of this beautiful city and the Confucius Temple is one of those places where you get to enjoy it in whatever language you speak!